We live cross industry innovations! Our expanding network enables us to create personal approaches to competent innovation partners, rapidly and uncomplicated. On our web platform BridgeUp! You will find appropriate competence partners, which are open for cooperative growth projects. Participating network and cluster manager use this tool for proactive cooperation initiatives between their members. The application field of 3D technologies grows not only in the consumer electronic segment, but will be increasingly popular in industrial and constructional planning and production processes. 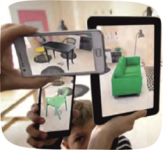 Furthermore, 3D imaging methods will change diagnostics and operation processes permanently. Current industrial applications present the centre stage of 3D technologies in product development, production increase and sales optimisation. 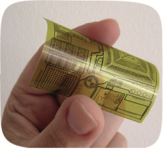 According to British market researcher IDRechEx market potentials for printed and flexible sensors will increase in the coming years. In 2013 the market share of printed sensors was 6,3 billion US Dollar, 2020 the share is to grow again more than 1 billion. The largest holder share bio sensors, above all glucose measuring strips for diabetic patients. Fibre composites had been reserved exclusively for high end applications for years, like aerospace or Formula 1. Nowadays composites have been established in other sectors. Whereas fibre composites have been used only for niche applications and therefore offerings are still quite limited, experts see high growth potentials for high-strength composites, mainly in the field of light weight construction. The most valuable asset of our company has developed to a WHOLE based on the SUM of many individual client projects: Our innovation network across all industries and lines of business enables us to provide real added value to our clients, even beyond our mutual projects. Our web platform “BridgeUp!” was created together with internationally renowned business clusters. It offers a unique opportunity to utilise the networks and competencies of businesses and R&D organisations that we cooperate closely with and which are open to growth opportunities across all industries, lines of business and regions. Our network partners and IMG are dedicated to our goal, “innovation through cooperation”. Together we offer impulses, detailed strategies and practical implementation support for creating new value-added partnerships, R&D cooperation or cross-organisation business development.